), but the attempt to do so was ultimately unsuccessful. created work for 80,000 men. was responsible for the bulk of economic growth between 1933 and 1938. Rearmament started almost as soon as Hitler came to power but was announced publicly in 1935. This created millions of jobs for German workers. The 1.4 million men in the army at this time. Jews who were sacked and their jobs given to non-Jews. Women who were encouraged to give up their jobs to men. for farmers to produce more food, were not successful. By the outbreak of World War Two Germany was still importing 20 per cent of its food and 33 per cent of its raw materials. The key debate of the time was ‘Guns or Butter?’ with Nazi Germany choosing to invest in military goods over civilian goods, preparing Germany for war. Despite the loss of freedom, life improved in Germany for many ordinary people who were prepared to conform and look the other way. Everybody had a job and a wage. (which the Nazis had promised to tackle) controlled over 70 per cent of production. Rearmament from 1935 onwards boosted profits and managers of the major industrial companies saw their wages rise by 50 per cent between 1933 and 1939. Small business - Rules on opening and running small businesses were tightened, which resulted in 20 per cent of them closing. 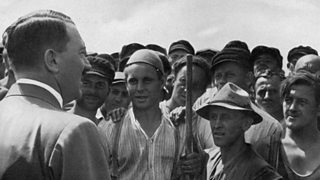 Farmers - Having been one of the main sources of their electoral support during their rise to power, farmers benefitted under the Nazis. By 1937, agricultural prices had increased by 20 per cent and agricultural wages rose more quickly than those in industry. The Hereditary Farm Law of 1933 prevented farms from being repossessed from their owners, which gave farming families greater security. The Labour Front. This was a Nazi organisation that replaced Trades Unions, which were banned. It set wages and nearly always followed the wishes of employers, rather than employees. Strength Through Joy. This scheme gave workers rewards for their work - evening classes, theatre trips, picnics, and even very cheap or free holidays. Beauty of Labour. The job of this organisation was to help Germans see that work was good, and that everyone who could work should. It also encouraged factory owners to improve conditions for workers. by employers if they attempted to question their working conditions.